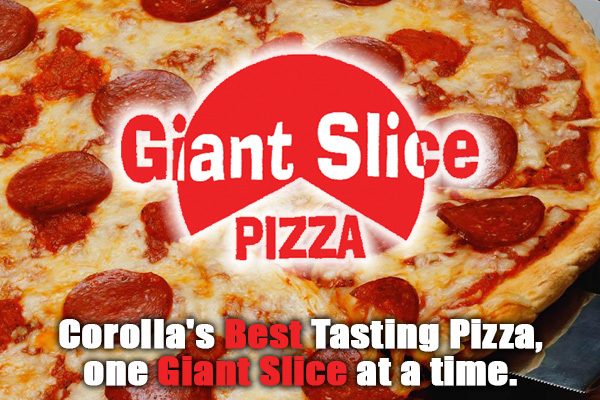 Giant Slice Pizza offers Corolla’s best tasting pizza, one giant slice at a time! We have been a Corolla favorite since 1994. Our menu includes authentic New York style pizza, stromboli, salads, subs, wings, calzones, appetizers and desserts. Our hand-tossed pizzas are cooked in stone ovens with your choice of more than 18 toppings. Giant Slice Corolla pizza is located in TimBuck II Shopping Center. We offer dine-in, carry out or delivery service that is free from Pine Island through Ocean Hill.